Wilmington, NC: Holiday events in Wilmington, North Carolina and the island beaches of Carolina Beach, Kure Beach and Wrightsville Beach fill the months of November and December with a great amount of cheer! Throughout the season, there are twinkling enchanted forests, candlelight home tours, parades, model train displays, concerts, theatrical productions, holiday tours, cruises, and New Year’s celebrations. From the river to the sea, visitors can immerse themselves in holiday arts and cultural activities and shop for one-of-a-kind and locally crafted gifts at beach and riverfront boutiques, shopping villages, art galleries and museum shops. Brighten this holiday season with a coastal getaway to Wilmington and its island beaches. To download a free 2018 Holiday Events brochure, please visit our Seasonal Highlights page. Here’s a sampling of holiday events. Insider Tips: Event details often change without notice and/or sell out in advance, so please confirm event date, time, place before traveling any distance. 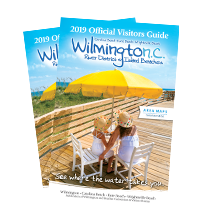 For a FREE Official Visitors Guide, email visit@wilmingtonandbeaches.com. For seasonal highlights and to download a free 2018 Holiday Event brochure, click here.